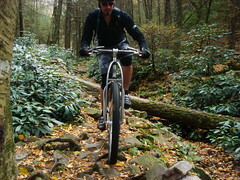 Fall in the Mid-Atlantic is prime time to ride and we are just getting into it now. Two weeks ago is when I really felt the change over. Spent 4.5 hours riding the Shed with Jason and beating myself up on the rocks. Warm, but not overly hot with a sprinkle of leaves on the trail and a few colors other than green starting to appear on the trees. 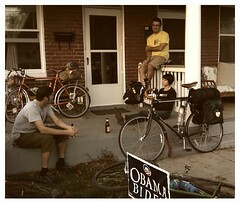 Back into town just long enough to wolf down some grub, swap bikes, grab some gear and roll over to meet a few others for a sub-24 hour overnighter in the woods about 12 miles out of town. Six of us rolled west into the sunset as the temperatures dipped lower than usual. My test to see if my sleeping bag liner was enough for cool fall temps failed as I was left shivering with off and on sleep all night. No matter, the beer and company around the campfire made up for it and I knew that fall had truly arrived. Photo by J. Stoner. � All rights reserved. Since then the riding has been almost as perfect as it can get with the exception of the short days cutting the evening daylight hours short. Everything has it's price and fall riding leads to night riding in short time. The days are warm, sometimes even hot but the sun feels good and not oppressive this time of year. The trails are so dry and packed down that they've taken on the characteristics of dusty concrete. Speeds are dangerously fast on the smoother trails and the fun factor is off the charts. 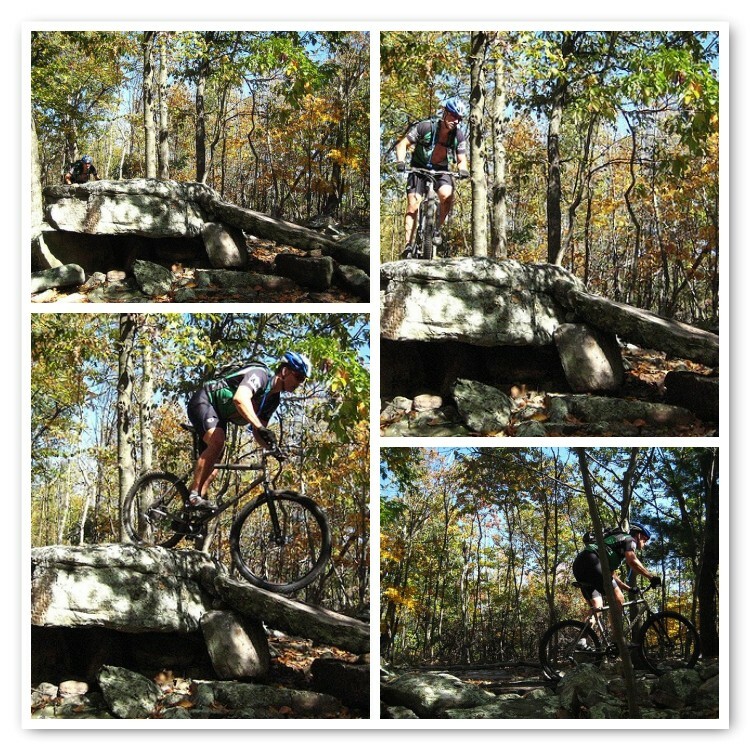 Spent some quality time at Schaeffer with my wife railing dusty turns. And now there is the crunchy, slippery goodness of fallen leaves adding to the cornering challenges and adding another element to nature's mix that we only get this time of the year. Yeah, four seasons is something I will never get tired of. 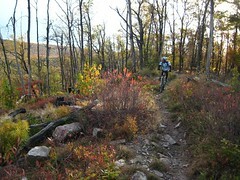 Looking to capitalize on the autumn bounty, a bunch of us headed north to State College, PA, home of the 2005 Single Speed World Championship and rocky ridge riding. Darius secured a 4H rustic cabin and organized the lot of us, Ma Nature provided the great weather and PA locals delivered on the trails. Temperatures continued to drop and were down in the low 30's on Friday night meaning warm sleeping bags and a stoked fire were necessary to keep the cold at bay. Saturday was a 7 hour feast of dirt in chilly conditions that left a few shattered and battered but everyone smiling once they were off the bike and putting down beers and food with memories of fine singletrack already replaying on the movie in their mind. Sunday was a little shorter with only 4.5 hours out on the trails but no matter, I don't think anyone was complaining about the stuff we rode as it was all high class with it's own dose of suffering served up all the way through. 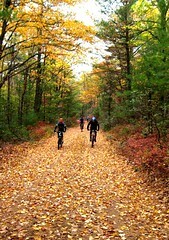 Leaves on the trees were just about peaking as well which just added to the ride atmosphere. Photo by T.Barsi. � All rights reserved. Now it's back to reality, trying to figure out how to maximize these fall days before the clocks get set back and old man winter arrives for his extended stay. Time to dig out the tranisition gear, the bits of clothing that haven't seen use since winter bid us goodbye and spring sprung upon us. It's that weird time of year when you need to dress in layers that can be shed as the morning temps can be 40 degrees cooler than the daytime highs. But the fall sunlight beating down on your face as the reds and oranges and yellows of the deciduous trees explode across the ridge line in a show of dazzling color while you rail a narrow slice of dirt make the wild temperature changes worth it.